I've played around with a lot of indie brands. Many end up feeling like something you've seen over and over again. 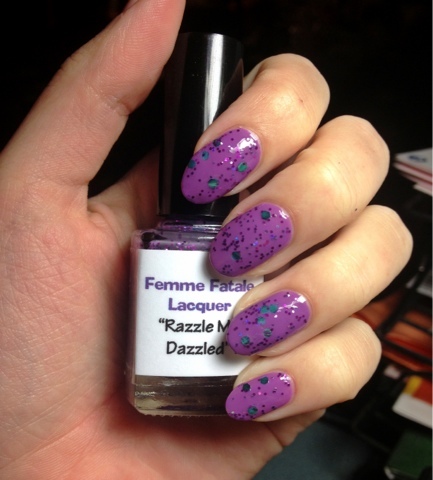 Femme Fatale Lacquer it on it's own planet! How refreshing! She has an amazing collection that is updated frequently and completely fashion forward. I have four polishes to explore in this post but she has over 15 polishes of her own creation available. Lets get right into it! 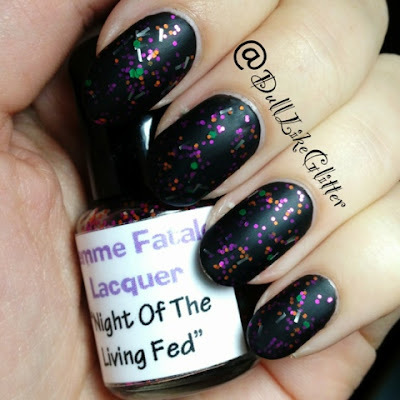 We'll start with a gorgeous Halloween shade, Night of the Living Fed. Night of the Living Fed is a black translucent jelly base with medium green hex glitters, small purple and orange hexes an silver bar glitters. 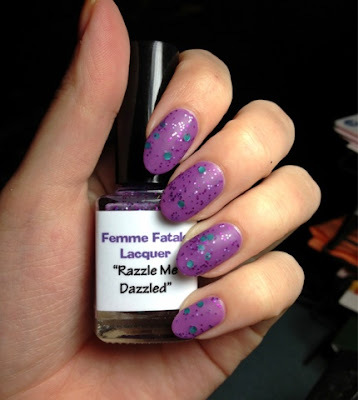 This mani is shown over China Glaze Liquid Leather and topped with Butter Londons Matte top coat. 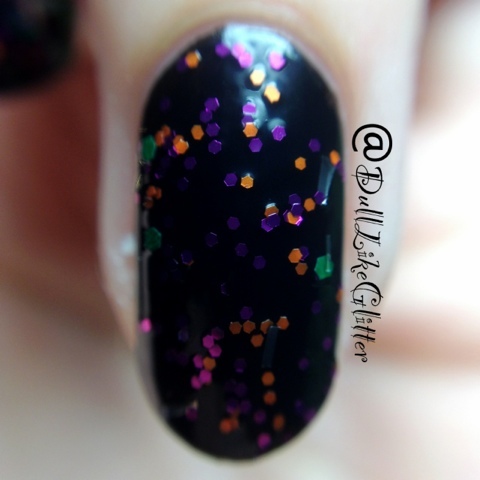 This is the perfect Halloween nail plish! Pick this up in time for the 31st. Here's an even better look at all the glittery goodness but this time glossy. It looks amazing any way you wear it! 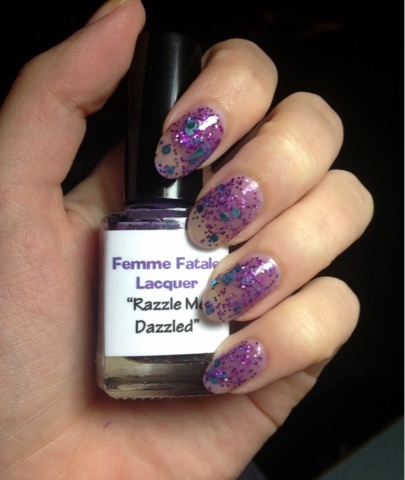 Next up is Razzle Me Dazzled! 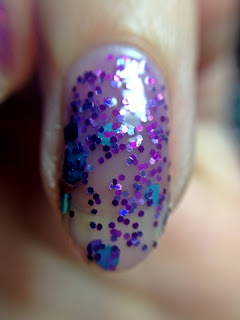 This is a gorgeous purple jelly base with purple and blue glitters throughout. 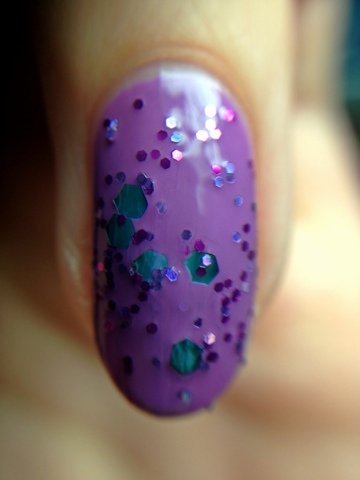 I used three coats alone to create a jelly sandwich look that is perfection! Here we have Razzle Me Dazzle over Ruby Wing Fate as an under coat. I love how it makes the blue glitters stand out! 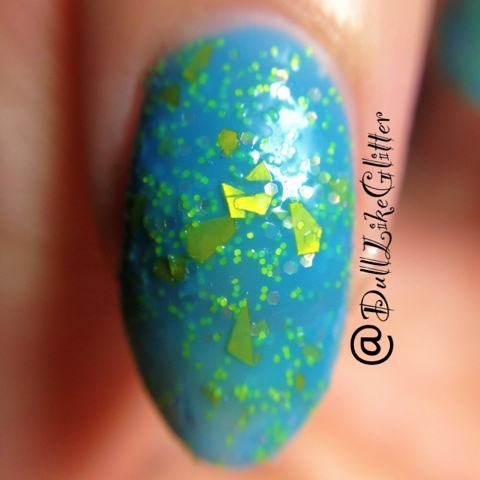 Next I played around to give it a matte effect by topping it with Butter Londons Matte top coat. I love how matte makes glitter look! Here we have a macro shot of Razzle Me Dazzled in three coats as a jelly sandwich and also in one coat over Ruby Wing Fate on the right. So pretty! Time to put some fruit in your diet! Here is Very Berry-licious! 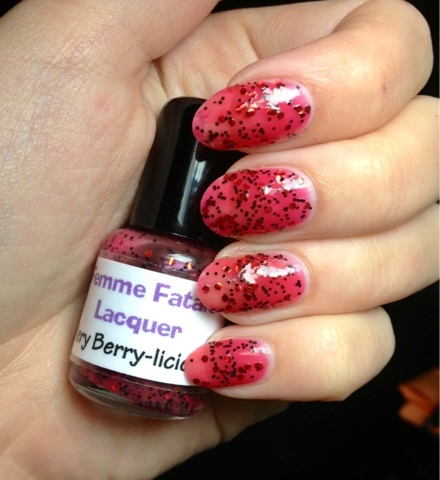 Very Berry-licious is a red jelly base with small black, seed like glitter and red hex glitters. Here we have a three coater jelly sandwich. And here is one coat of Very Berry-licious with Essie Forever Yummy underneath! Reminds me of delicious strawberries or watermelon on a hot summer day. This is also the perfect firey mani for a night out on the town. I got tons of complements! It is so hard to pick favorites but Twinkle Twinkle Shattered Star was the color I was most looking forward to trying and I am not disappointed! 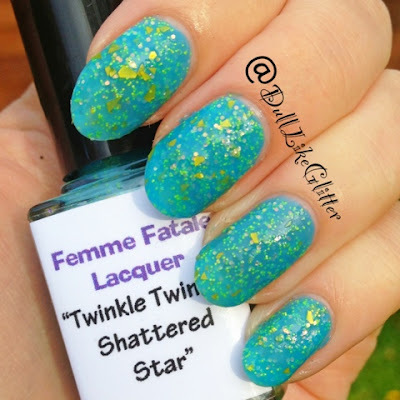 Here we have three coats alone of Twinkle Twinkle Shattered Star. It is a very pigmented teal jelly base with shattered yellow glitters, small yellow glitters and white translucent hex glitters. Absolutely gorgeous and like no polish I have seen before! A macro shot of Twinkle Twinkle Shattered Star in all its glory! 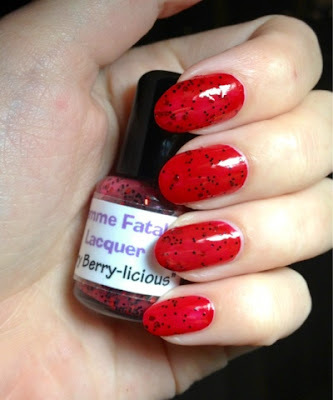 I would completely recommend any of Femme Fatale Lacquers polishes. They are high quality, chock full of glitter and very affordable. She sells minis for for $4 and full size polishes for $8. Suport this amazing indie brand! You won't regret it. I can't wait to see the amazing things she has to come.